An adorable eight-by-eight-foot, two-story tree house, complete with a sitting room and sleeping loft, towers over the Thomases’ lush backyard garden in West Asheville. Container plants greet visitors to the 1927 brick bungalow where Melissa and Patrick Thomas and their children, Annabelle and George, live. The fenced backyard garden is a dream. Among the features is Annabelle’s fairy garden (top), where an old side table and mirror add intrigue. In the living room, where a brilliant vanda orchid hangs in the window, antique and vintage mirrors help bring light and a sense of spaciousness to the small room. A sectional Ikea sofa is great for family movie nights. Some furnishings were sourced from yard sales, including the dining room table and $2 pendant above, which Thomas painted white and made into a light. In the kitchen, the couple kept it clean and classy, with black cabinets against white walls and a beadboard ceiling Patrick installed. Annabelle’s bedroom is full of natural and magical touches, from the floral bedspread and pillow to the rabbit curtain holders to dainty vials of fairy magic. Mounted ferns and botanical prints bedeck the walls. Dainty vials of fairy magic. George’s room encourages a sense of wonder, with a map of the West Indies adorning one wall. Philodendrons, ferns, and spider and snake plants all thrive in the humid, low-light conditions many bathrooms allow. ...a makeshift screen for outdoor movie nights. 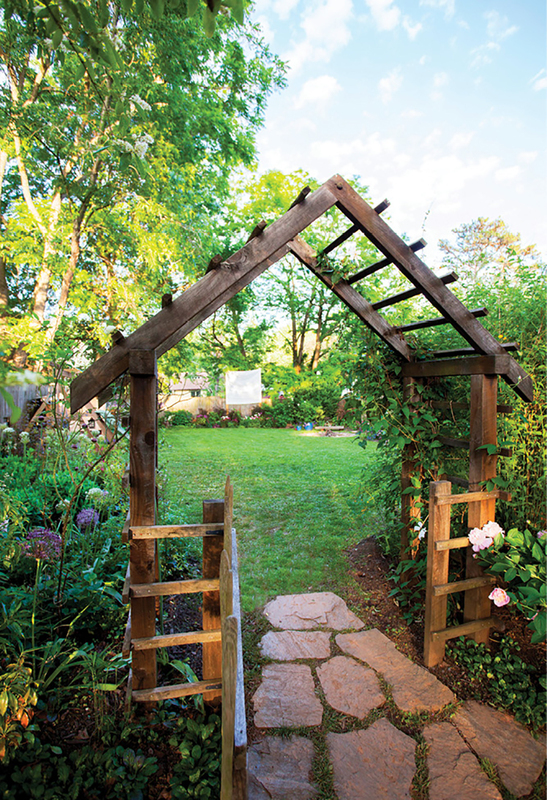 Entered via a wooden arbor, the backyard features an array of plants grown for Thomas’s shop, fairy and vegetable gardens. In the tree house, Annabelle and best friend Jackson can play games or relax with a book in the loft, surrounded by stained glass and diamond-style windows. When it came to picking a profession, Melissa Thomas’s choice seemed preordained. As a little girl, she turned her backyard sandbox into a mini-garden, and her first job out of high school had her fashioning bouquets at a flower shop, which she loved. Sitting in the yard behind her West Asheville brick bungalow, she playfully confesses that she’s “got a problem” when it comes to her affection for plants. “It’s a good thing I turned it into a career,” she says. There were other paths open to her. For a time, Thomas pursued a degree in decorative restoration for historic structures, but the joys of all things green and growing pulled her back in. Destiny truly took root after she designed the flowers for a classmate’s event in downtown Asheville. She did the job at cost and just for the fun of it, but the next day, she started receiving calls for more floral design gigs. Soon, she’d set up a flower studio in her basement to handle all the requests. Today, Thomas owns the dreamy West Asheville shop Flora. Inside, a wall is papered with botanical prints stripped from the pages of her high school textbooks and other titles passed down from her grandfather. Bulbs poke their heads out of stylish pots, vines tumble down the whitewash plaster walls, and somehow even the air feels softer and cleaner inside the shop’s windows, which look out onto the hustle of Haywood Road. For those who have visited Flora, it will come as no surprise that Thomas’s house feels just as vibrant and welcoming. The three-bedroom 1927 bungalow sits on a straight-line street in a west side neighborhood. It’s the sort of place where kids still play outside and parents call them in by shouting their names from front porches. This warm and lush spot is where Thomas lives with her husband, Patrick, who owns a house painting business, and their children Annabelle, 10, and George, five. It’s also where she grows many of the flowers for her shop, sometimes with help from the Graceful Design Gardens crew. Even the artwork brings flowers into the room. In the dining room, an oil painting of a vivid bouquet was painted by Thomas’s mother as a teenager. A print of Van Gogh’s Sunflowers and vintage still lifes of blooms carry from room to room. In every photo, the kids are surrounded by nature: A smiling George sits tucked in a patch of tall grass; a tiny Annabelle walks the paths at Biltmore’s solarium, dwarfed by towering plants. In her home, the previous lives most likely have familial ties and story lines. A set of her grandfather’s clothbound books sits atop the built-in bookshelves in the living room. The cabinet below displays a set of blue delft dishes inherited from Patrick’s uncle. Annabelle’s grandfather made sure his early American turned-wood bed would be where she rested her head. All the pieces and touches fall together like a home cultivated over the years, where branches of family history are intertwined. Before the kids, the house relied on a neutral palate. But when they arrived, color came into the picture, from the dining room’s deep blue walls (“Because who doesn’t love navy?” Thomas says) to the pale pink that Annabelle chose for her bedroom. Thomas picked the shade of green on the living room walls because it reminded her of fresh stems. The canopy of a large oak tree out front that helped Thomas fall in love with the property shades the living room for three seasons. She created an illuminating solution with a collection of vintage and antique mirrors on the wall that bounces rays all around. A roomy charcoal sectional with an oversized ottoman are perfect for family movie nights, when the whole bunch piles in together. The kids’ bedrooms have all the signs of childhoods marked by wonder. A map of the West Indies in George’s room covers an entire wall, inspiring a sense of adventure. Annabelle loves science, and in her room, there are signs of a curious mind, from the microscope on her dresser to the items she’s collected in glass boxes and jars, like butterflies and part of an owl’s wing. There’s even a fairy door on the baseboard just below the window. Outside space is an important extension of the house for this family that is growing in all directions. Spring through fall, friends and neighbors regularly gather for outdoor movie nights in the backyard among the blooms. There is a bevy of plants there, almost too many for Thomas to remember, including allium, fritillaria, heuchera, hydrangea, lily of the valley, astilbe, viburnum, toad lilies, and ninebark, as well as tulips and peonies that will likely be picked to create a wedding bouquet or arrangement at the shop. Place a few pallets on the ground, pile on the cushions, pin up a white sheet to serve as a screen, and it’s films al fresco. Overlooking it all is a tree house so impressive it could have been Patrick’s one fatherly feat. In the main room, there is a couch and low table. Scattered about are the signs of fun—pens, papers, and toys. If mom loves botanical prints, her daughter loves illustrations of butterflies and insects, which dot the walls. Up another ladder is a daydreaming loft surrounded by stained glass and diamond-style windows that’s even been used as a guest quarters in warmer months. • Buy your plants from a reputable dealer to ensure they are healthy. When a plant doesn’t thrive, it isn’t always the caregiver’s fault. “Maybe you got a plant that wasn’t happy, and it had nothing to do with you,” Thomas says. Plus, a good garden store will be able to give you specific instructions on how to care for your plant. • Pick plants that are hardy and can handle a little neglect. • Consider light and temperature. If you have a historic home with drafty windows, factor that into your plant choice. • A go-to indoor plant choice is sansevieria, also known as mother-in-law’s tongue or snake plant. It doesn’t require a lot of light or attention, and it’s great for improving air quality. • Bathrooms are a smart place for plants that like humidity. For instance, staghorn ferns absorb water through their fronds, so they love to soak up that shower fog.